Red Oak Butterscotch Retro Stair Tread Closed 11.5 in wide x 36 in long - shipped pre-stained in Butterscotch and then finished with our UV Cured Diamond Coat II - ready to be cut-to-size and installed as soon as you receive them. Can I order just one of these to test out? Sure - you can order as many or as few treads as you need. Many people order a single tread and riser to test the fit of the products before placing their full product order. i have a landing area. do i use one of these treads or is there a smaller one that is not as deep that can i order. or do i just cut it to the right depth? You will want to use a landing tread, which is 5 1/4" deep versus the 11 1/2" deep treads. You can find the landing treads at the link below. What type of finish is provided with Butterscoth Stain? Is it the same as Bruce prefinished flooring? Our prefinished treads are not exactly like Bruce prefinished flooring, but they are similar in stain color and finish. We *strongly* recommend ordering a sample pack to compare the stain color to your flooring first because stain colors may shift over time on both the flooring and our treads. Do you provide/under take installation of re-caping the retro plank on existing staircase . We unfortunately we do not do installations. Standard stair replacement is very easy to do. A lot of our customers do the installations themselves after looking at our "how to" video. We recommend servicemagic.com to help find installers. we have Armstrong Park Ave/Pradoo flooring, and would like retrofit treads and risers for the stairs. Which shade would you recommend? 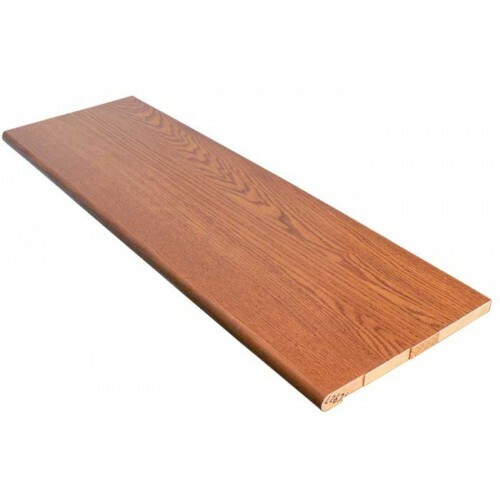 The Red Oak Sample Pack, that comes with 7 stain colors on red oak, is the best option. If the colors are not a match, then call a friendly team member at our toll free number (866) 429-0979 and someone will be happy to assist you in finding what is a best match for your flooring. I see the Oak Stair Tread is 36" wide. How deep is this tread? These treads are 11 1/2" wide from the front of the bullnose to the tail of the tread with a 10 1/4" undercut (the part that is 3/4" thick). 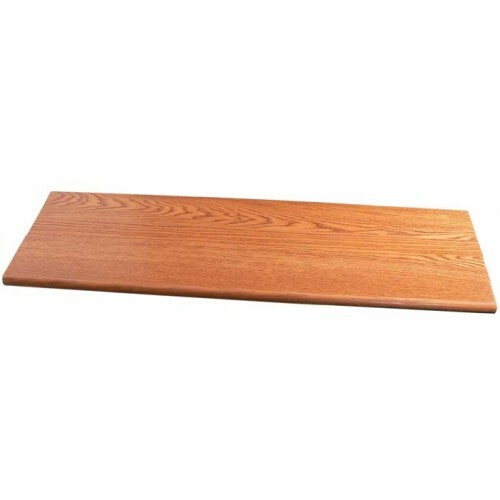 I need a 3/4" Red or White Oak Treads and Risers made of Oak. Is that available in Golden Oak Stain or without a finish. Is the price $43.65 per single stair tread. So if there is 10 treads I would pay $436.50? The price shown is the price per tread. So the cost of a single Red Oak Butterscotch Retro Tread at 36" is $43.65. We package 5 stair treads into one box, or if the treads are standard 3/4" there are 10 in a box. All of our treads are priced by the piece. You can order as many, or as few as you need. summer expansion. Is this not a problem with staircases? I have done many floors, but this is my first staircase. Our retro treads are 3/4" thick and guaranteed for life against stave separation. A properly formed glue joint is much stronger than the actual wood itself. Expansion and contraction due to moisture is a concern with any wood product but the surface area on stairs is much smaller than a room of hardwood flooring. We have not had any reports of glue-bonds between tread and substrate breaking unless an adhesive with a high moisture content is used during installation (i.e. a water-based easy clean up / low odor adhesive). hi, the stair i need to cover are 11 1/4" front to back and 37 inches wide. can you provide a custom size that would fit this requirement? i would need 12 steps. We can not customize treads that are 37" wide, however we recommend that you order the 42" treads and cut to 37". The cost difference is minimal and it is a sure thing that you will get them to fit correctly. Here is a link to the 42" butterscotch retro stair treads, which are 11 1/2" deep X 42" wide. All of our treads are designed to be cut to size. What flooring matches this color? Butterscotch flooring from Bruce Hardwoods is a good match to any of our Butterscotch stained products. There are also several other brands that match well but this color is specifically formulated to match the color from Bruce. We are planning on having the stair case curved out at the bottom so the treads would be longer and cut at an angle at the bottom would you be able to supply either longer treads that we cut to fit or longer treads that you cut? We would need to see photos or sketches of what style tread you are trying to install. You can send photos or sketches to us at sales@stair-treads.com with the specs and we can take a look and if we can make the custom tread we will get you a price on it if you include the species/stain color and shipping zip code. step? Won't the last stair rise (top) be low? Isn't that against building code? The 3/4" Stair Tread on the first step will not be an issue, since all the treads are being increased by the same amount. You will not be able to feel or see a difference. The very top step will be a little lower, unless you install the Landing Tread. 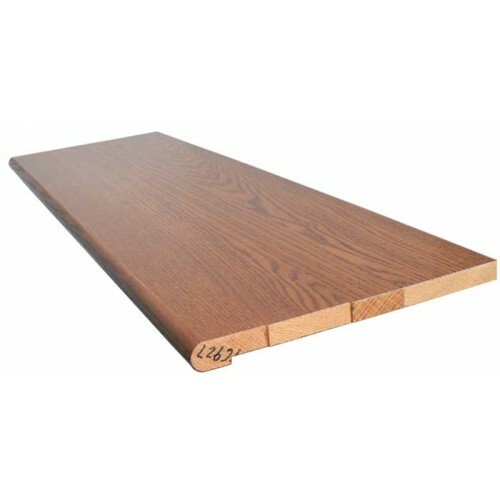 The landing tread is 3/4" thick also, and has a groove in the back for carpet or hardwood to be set in the groove. This is a transitioning piece from the staircase to the floor it leads to. Visit the link below to see more about this topic. 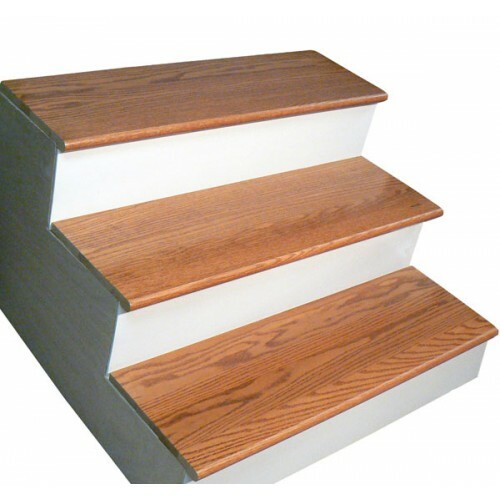 are the stair treads sold in cases? 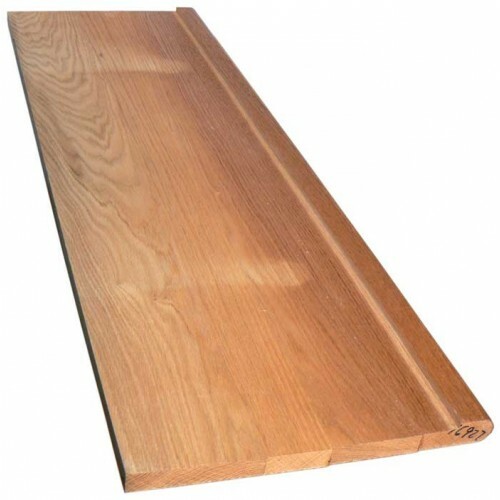 All of our stair treads are sold individually so you can order as few or as many as you need for your project without having to worry about ordering full case quantities. I have a stair case that rises 5 steps to a landing about 3 X 3, then goes up 5 steps to a second landing, and then 5 more to to the top floor. What should I do with the landing? I think that I would want wood flooring that matches the treads, correct? At the very top, the second floor is carpeted. What is the best way to transition here from carpet to wood stairs? For the landing I would use our Tongue and Groove Panel System. The best way to transition from wood stairs to carpet would be to use a landing tread.